If we have a strong economy why are we still having cuts to services? Last year, the British economy grew faster than the United States, faster than Japan, faster than France. Indeed amongst the major advanced economies Britain’s growth in 2016 was second only to Germany. With our economy finally growing in apparently spectacular fashion it could be expected that the draconian cuts would be replaced with fiscal stimulus restoring our damaged public services back to pre-crash levels. Yet there are more stringent cuts to come in all sectors. David Hodge, Leader of Surrey County Council took the drastic measure of threatening a referendum to secure a 15% hike in council tax unless the local authority were given increased funding from central government. There is a social care crisis in Surrey where support for adults and children requiring long-term care has fallen well below acceptable levels. Hodge, who is the leader of the conservative group in the Local Government Association and a strong supporter of the conservative government felt compelled to speak out. Shortage of funds in Surrey has led to complaints of pot-holes in the road left unrepaired, street lighting in many areas turned off at midnight to save on energy bills and charges were applied at local refuse centres leading to a spate of fly-tipping. Britain is the 6th richest country in the world and Surrey is one of the most affluent areas, yet there is apparently no money to pay for these essential services. So where is all the money? 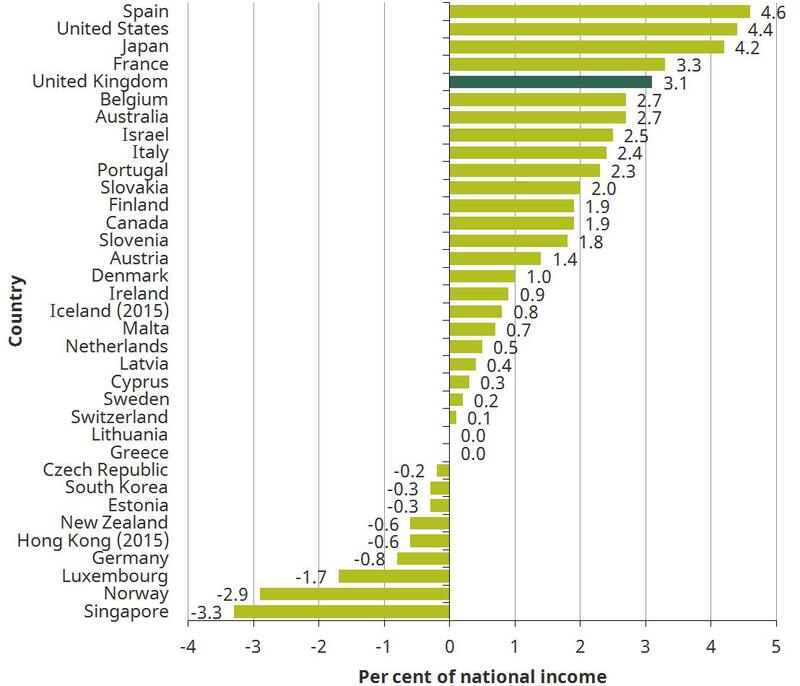 The financial crisis led to a sharp reduction in national income. Even more striking is the weakness of the subsequent recovery. Official forecasts suggest that GDP per adult in 2022 will be 18% lower than it would have been had it grown by 2% a year since 2008 – broadly the expected rate of growth at that time. This downgrade in expected income has adversely affected the finances of households and of the government. Turns out Hammond’s statement is not reflective of strong economic growth but a distortion of the facts, as you can see in the graph below, with France, Japan and US being even more sluggish than ourselves. Our growth in 2016 may have been second only to Germany but a significant difference is that the German economy is not running a budget deficit at all. Norway has one of the most successful economies and this country is run by a left-leaning coalition elected via proportional representation. In an attempt to reduce the deficit, the difference between the money taken in tax revenue and the money spent by government, Mr Osborne severely cut benefits to the most vulnerable groups but instead of using the saving to rapidly bring down the deficit, he gave it away as tax breaks. This has elongated the recovery period giving more time for the government to salami slice public services and move public money into private hands through the marketisation of the NHS, transfer of education to academy schools, and the contracting out of prison, military services and many others to private contractors. The austerity agenda has been used to move money from poorest to the richest and constitutes a ‘race to the bottom’ to bring our living standards in line with those of developing countries. One reason for the ratio shift is a move away from progressive income tax, based on ability to pay, into regressive taxation such as higher VAT where everyone pays the same amount. Although Theresa May states there are ‘no plans’ for further tax rises she has not ruled them out. ‘No plans’ simply means no plans this side of the general election. When private companies take over public services they become private monopolies not marketplace choice. The public services become unviable as they lose one contract after another and fall away losing experienced staff and public assets to the community. Private monopolies are not subject to market forces as they have no competition. They are not controlled by the democratically elected local council but are increasingly funded directly from central government. They are not subject to the Freedom of Information Act 2000 so do not have to release information concerning their costings, policies or programmes. In fact, they use ‘commercial confidentiality’ to keep information secret right up to a court hearing. Which makes them virtually unaccountable to members of the public and campaign groups. TUC General Secretary Frances O’Grady said: “The ORR has once again shown that a public service railway will always be dependent on taxpayer support. But the private train operators treat it as a cash cow, gobbling up almost £4bn in public subsidy yet charging the highest rail fares in Europe while paying almost £200m out in dividends to their shareholders. To make a mockery of the ‘take back control’ mantra, most of the rail franchises are owned by foreign companies who benefit from low fares at home, while those in the UK are the highest in Europe. South West Trains which serves lines into Waterloo is to be taken over by MTR, a Chinese company. First MTR will take over from Stagecoach, which has operated the South West Trains franchise since the UK rail network was privatised in 1996. The Rail, Maritime and Transport (RMT) union said the Chinese company – which also has the contract to operate trains on the Crossrail route in London – was set to make “a killing at the British taxpayers’ expense” as it joined the Dutch, German, Italian and French national rail operators in running private franchises in the UK. MTR is majority-owned by the Hong Kong government. Although this operator will pay £2.6bn in premiums over the next 7 years South West Trains were able to deliver a £16m dividend for its present owner Stagecoach in 2014 on the back of rising ticket sales and government subsidies. There is increasing demand for this service and the longer platforms at Waterloo will enable the new owners to put on extra carriages at little cost outlay. Not only is it money on a plate but the terms of the contract mean that the taxpayer takes the risk should revenues fall due to Brexit. Southern Rail’s attempt to remove guards from trains is a visible sign of how costs are cut by private companies to the detriment of the public who depend on guards for safety, disabled access and information. Once Southern rail break the union resistance the other operators will follow but it is unlikely that any of the cost saving will be returned to the public in reduced fares or to the treasury in higher premiums. Since 2010 corporation tax has fallen from 30% to 19% in 2017 with plans to cut it to 17% by 2020. Most advanced economies have a corporation tax around the 30% mark and only Switzerland is lower at 17.9 %. It can be seen that since 1984 corporations have benefitted from keeping a larger share of their profits in the expectation that these companies will invest and create jobs. However, since the 2008 crash, 40% of new jobs are self-employed who now make up 15% of the labour force. guardian.com/business/2014 Many of these could be budding entrepreneurs who would take on more staff if they were given government incentives, yet these were the very people who were targeted for increases in NI payments the Spring 2017 budget. The trickle down philosophy simply rewards those already at the top making it even harder for start-ups to get a hold in the marketplace. The myth that the conservatives are the party of fiscal responsibility. We have been told that austerity is the only way to get back to a strong economy. That the Labour Party would borrow recklessly to spend money on public services and restoring public sector pay and this would put us back into recession. Yet borrowing under the conservatives has been higher than any borrowing under labour seeing the debt rise by £555bn since 2010. This has brought the debt ratio to 85.3% to GDP ( Jan 2017) much higher than that inherited of 67% in 2010. The difference is that the conservatives have borrowed not to invest in public services and infrastructure which would have grown the economy faster and provided assets for capital leverage, but to give tax breaks to the already wealthy. Much of this money fails to be returned to the economy as taxed earning and spending but is filtered away into offshore accounts where minimal tax is paid. Spending fuels the economy, not jobs. It is clear that jobs do not fuel the economy as we have the highest employment rate since records began in 1972 at 74..6% ons.gov.uk/apr2017. But low paid work does not provide sufficient disposable income to fuel the economy through spending. Consequently, consumer confidence fell to -5 in April. Here is a recent summary from Retail Economic. Economic growth continued to be supported by the strong performance of the services sector. In particular, consumer spending rose by 0.7 per cent in Q4 2016, compared with the previous quarter, maintaining the strong momentum built up throughout the year. However, a more detailed breakdown revealed real household disposable income fell 0.4 per cent in Q42016 on the previous quarter. On an annual basis, growth was flat meaning it was the weakest since the final quarter of 2013. The truth is that in this ‘strong economy’ wages have stagnated against costs, now compounded by rising interest rates and a fall in the pound. Britain is the only large, developed country where wages fell when economic growth returned. Wages are worth less than they were 9 years ago. The Resolution Foundation Report predict the worst decade for pay growth in 200 years. Britain is in a race to the bottom, to bring us in line with developing countries. The same factors that are currently dragging on the growth in living standards are likely to intensify. We project that income growth will slow to 0.3 per cent a year for the typical working age household over the next four years, once we account for housing costs. This overall weak growth also hides a division between growth for some and falling living standards for others. Our projections suggest that incomes will rise slowly for high income households, stagnate in the middle and fall at the bottom. Very significant cuts to working-age welfare of over £12 billion are a key component of what looks set to be falling living standards for almost the entire bottom half of the working-age income distribution between this year and 2020-21. The result is the biggest rise in inequality since the late 1980s. Despite the lowest business rates in Europe investment has lagged since the financial crisis. Many may wait out the uncertainty of Brexit, with some deciding to relocate in order to maintain access to the single market. The Bank of England says it expects investment levels to stay weak in the UK, as it finds four in five publicly owned firms saying pressure to create short-term returns has dented investment levels over the past five years. If investment had continued at pre-crisis trend the private sector’s capital stock would be around £240bn larger, Cunliffe [deputy Governor of the Bank of England] said. Productivity, the level of production for each hour of work, has flatlined since 2008. Rising productivity is the key to rising wages and improvements in living standards yet it has been sadly neglected as a performance indicator. In the nine years since the low point in mid-2008, productivity has grown by only 4pc. By contrast in the nine years to the peak in late 2007, output per hour jumped by 20.7pc. The tax gap, the difference between tax collected and tax due, stands at 6.5% or £36bn. UK.government/HMRC-measuring-tax-gaps-2016 Although this has closed recently this is largely due to retrospective changes to tax law which has allowed HMRC to reclaim tax from ‘avoidance’ schemes which were legally operated at the time. This has led to some high-profile celebrities receiving censure through the press and many individuals, who took advice in good faith, have gone bankrupt due to these ‘retrospective’ powers where the state can reclaim funds even if the case is won at tribunal. David Kirk, an expert in tax law said the following about a retrospective tax on contractors loans in 2016. Dominic Raab the MP for Esher and Walton since 2010 has written widely on the subject of the economy. He has also stated on many occasions that he has fought for a change to the Whitehall funding formula which sees Elmbridge receive just a quarter of funds it pays to central government. It is possible to access Hansard references via a site called ‘Theyworkforyou’ There is only one reference to Mr Raab speaking on Whitehall funding formula which was a call to lower business rates in 2012. theyworkforyou+funding+formula Under the new deal with central government, Surrey will be allowed to keep 100% of business rates in the near future – indicating that this is a vital lifeline for the ailing authority.